In the Netherlands, stream restoration generally refers to the construction of low-sinuosity channels. After construction, these channels typically show little morphological changes in time, mainly due to oversized cross-sections. Occasionally, pronounced morphological changes do occur, including meander cutoffs. In literature, two main types of meander cutoffs have been identified. Neck cutoffs can develop by the progressive migration of an elongated bend into itself. Chute cutoffs are shortcuts developing over a point bar within one bend (Lewis and Lewin, 1983). Neck cutoffs are more likely to occur in high-sinuosity meander bends, whereas chute cutoffs appear in meander bends featuring a moderate to low sinuosity. Here we report on a recent cutoff event that occurred right after the realization of a stream restoration project, showing a chute cutoff can develop within less than four months. 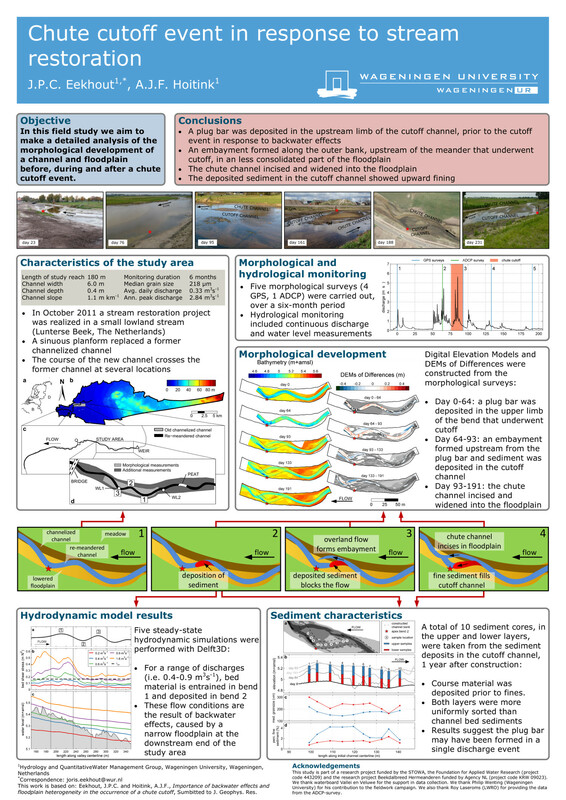 Results of a chute cutoff event are presented that occurred in a small lowland stream in the Netherlands. The new channel was formed in a period of 4 months after construction was finished. Future work will focus on the adjustments of the new channel alignment following the cutoff event, and on analysis of sediment sorting processes.